“Dell Inc. on Tuesday said it reached a deal to take itself private, in a buyout that marks an unofficial end to the era when a handful of young entrepreneurs made PCs the dominant computing device,” Anupreeta Das and Ben Worthen report for The Wall Street Journal. The irony doesn’t get much thicker. This will also mark the end our long-running, “Apple now worth X times Dell’s market value” articles. Boom, you got him, Steve! 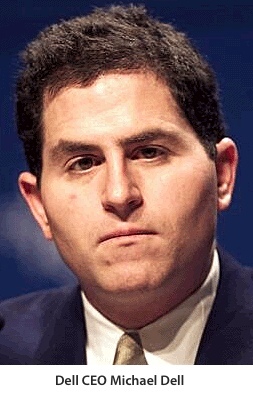 If you mistakenly click on Michael Dell’s face in the pic of the article, it takes you to a terrifying page with just that pic there. It’s scary. Steve. Ask God for a one day Pass. Please. We want to see you enjoy DELL sucking big time! With rescue funding as loan from MS (how much was that again? ), Dell will make the next Win 8 Server line for MS.
At least he follows his own advice.